My research initially was to investigate ergonomics of how we use technology, our preconceptions and how any affordance is standardised into recognisable instructions. We have been exposed to many instructions in our lives and every workplace has its Health and Safety instructions for the tasks within that environment. Another area of research that I found of value was, how difficult it seems to be for vested interests to be able to promote the proposition of healthy eating. Most medical or institutional information appears to be lack lustre in their approach and do not seem to be able to promote the healthy living that our government wishes us to aspire too. Often the information is patronising or made up of cartoons and only capable of engaging its audience in a very flat one-dimensional manner. I began taking apart what is expected within ergonomic diagram and I investigated how changing the object that the represented user interacts with, alters the perception of the rules given within the instructions. I endeavoured to ask the question “that if an object is placed dramatically out of its usual context and put within a mundane instructional diagram, do the instructional commands still work for the end user”? A question I hope is answered by my work. 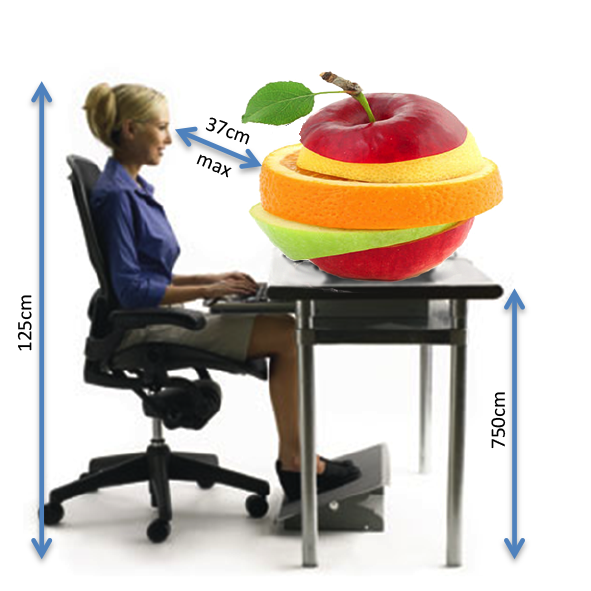 In laying out my work, I placed the fruit in the PC users line of site and added an arbitrary measurement, so that the person viewing my piece should quickly grasp the message and humour. I hope that my work shows that we need to re-appraise the way we “operate” with our healthy foodstuffs. My project may offer a novel set of affordances that the viewer understands and engages with, through their familiarity with instructional information and the unexpected situation of “target” items. Where my presentation piece may have some weakness is if the viewer cannot see beyond the representation of the image to discover the intended novelty and humour of the piece.